Why not bring it with you?? 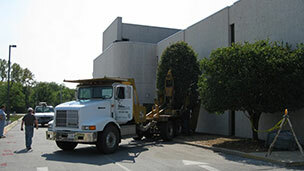 If you are moving and have trees with sentimental value, why not bring them with you. We have had customers that were moving out of state and had trees they planted when there children were born and we custom dug the trees for them so they could bring them with to there new home. We can ball and burlap trees from 1″ up to 9″ diameter. We can basket trees for you to reinstall yourself or we can install them for you. We can use one of our five tree spades to custom dig your trees. We can dig trees and basket them in any size from a 32″ basket to a 90″ basket. Feel free to call us (815) 469-6061 for all your tree care needs.